The classic tartan is modernised by the streamlined silhouette of the zipped mini in the Dawson Asymmetric Zip Plaid Skirt. Spotted on street style blogs everywhere, this plaid is the must-have of the season. Equal parts festive and on-trend, this skirt can be paired with basic tops and statement jewellery. 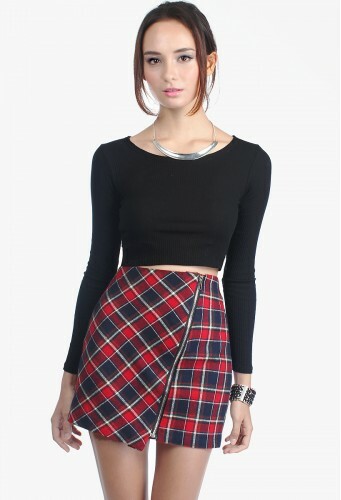 Made of plaid cotton-polyester mix, fully lined (lining: satin-polyester; non-stretchy). Features exposed silver zipper, inner button closure and asymmetric hem. Size XS measures 12.5" - 13" waist, 16.5" hips, 14.5" - 15.5" length. Size S measures 13.5" - 14" waist, 17.5" hips, 15" - 16" length. Size M measures 14.5" - 15" waist, 18.5" hips, 15.5" - 16.5" length. Model is UK 6, 1.7m, wearing Size S.